Krishnaraj Somayaji Dept. of Conservative Dentistry and Endodontics, Manipal Academy of Higher Education, Manipal, India. Mohandas Rao Dept. of Anatomy, Melaka Manipal Medical College, Manipal Academy of Higher Education, Manipal, India. Nagabhushan Somayaji Dept. of Anatomy, Melaka Manipal Medical College, Manipal Academy of Higher Education, Manipal, India. The Pterygospinous Ligament (PSL) extends from the Pterygospinous process of the lateral Pterygoid plate to the spine of the sphenoid bone. Sometimes, it may be ossified forming a bar of bone bounding the pterygospinous foramen to which mandibular nerve and its branches are variably related. Mandibular and chorda tympani nerves may get compressed depicting various clinical symptoms, which in turn depend upon dimensions of the foramen and grades of compression. Therefore, knowledge of the position and extent of ossification of PSL and its relation to the important structures in the deep infratemporal fossa is important for radiologists, neurologists, maxillofacial surgeons, dental surgeons and anesthesiologists during various anesthetic and surgical procedures. SOMAYAJI, Krishnaraj; RAO, Mohandas; SOMAYAJI, Nagabhushan. Anatomical and clinical significance of Pterygospinous and Pterygoalar ligaments and bony bars in dentistry.. Journal of Oral Research, [S.l. ], v. 8, n. 1, p. 82-90, mar. 2019. ISSN 0719-2479. Available at: <http://joralres.com/index.php/JOR/article/view/joralres.2019.003>. Date accessed: 23 apr. 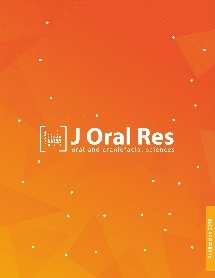 2019. doi: https://doi.org/10.17126/joralres.2019.003. Pterygoid; ligaments; foramen ovale; sphenoid bone; oral and maxillofacial surgeons.